LVDT stands for Linear Variable Differential Transformer. We can simply call Differential Transformer. Sensor: A device that converts a physical motion into an electrical output. Actuator: A device that converts an electrical signal into a physical output. The sensor is an electrical device, used to transfer the mechanical motion into electrical signals. But a transducer is a device that converts one form of energy into another form of energy. So every sensor can become a transducer but every transducer cannot become a sensor. See the following schematic diagram represents the circuit connection of a Linear Variable Differential Transformer. 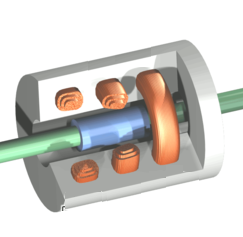 The Cylindrical ferromagnetic core is connected to the object which is needed to be measured or it can be connected to a plunger. There are three coils one is the primary coil and the other two are secondary coils. An AC current is passed thru the primary coil. This cause the voltage difference(V0=V1-V2) in both secondary coils along the length of the cylindrical core. Now as the core is in neutral position then the voltage difference will be zero. 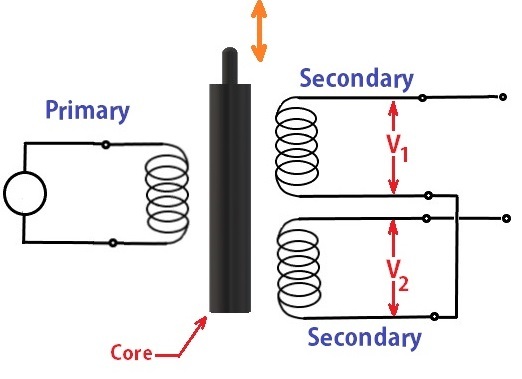 If the Cylindrical core slides then there will be a voltage difference will be induced in between the two secondary coils. This is how we will convert the physical motion into electrical signal/ electrical current/voltage. LVDT sensors are used in Tensile testing to know how much elongation is happened precisely. Linear Variable Differential Transformer sensors are used to determine the pressure and load. As positions sensors, Linear Variable Differential Transformer sensors have a very wide range of applications. In Automation Industries used for industrial gaging, TIR measurements. Used as a miniature position sensor in Aircraft industries. LVDT position sensors are used as signal conditioners to control the operating power of Power Turbines industries. LVDT position sensors are used as charge sensors in hydraulic accumulators in Hydraulics. That’s great and do they go hand in hand with the signal transmission like telemetry, rectifier.